They say the truth will set you free. That's what Princess Diana - the hero known to the world as Wonder Woman - believed. But she discovered a far darker truth, learning that her entire life and history had been transformed ... and it has driven her to madness. 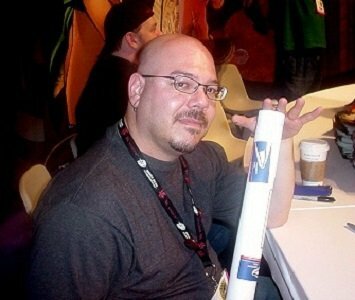 The author of four novels about professional bodyguard Atticus Kodiak -- Keeper (nominated for a Shamus Award by the Private Eye Writers of America) , Finder, Smoker, and Shooting at Midnight, Greg Rucka has been writing since he was eight years old, and hopefully is improving with age. A longtime comics fan, his first graphic novel series was the suspense thriller Whiteout, published by Oni Press and nominated for three Eisner Awards in 1999. Since that time he has been a contributing writer for DC Comics and an active participant in the Batman series of titles. Photo by Artemisboy [GFDL (http://www.gnu.org/copyleft/fdl.html) or CC-BY-SA-3.0 (http://creativecommons.org/licenses/by-sa/3.0/) ], via Wikimedia Commons.